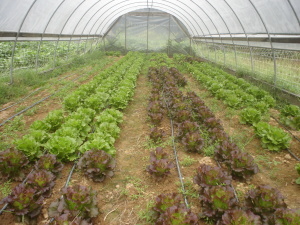 Home → Organic → Basics of Organic Production and Certification → What is Organic Farming? Certification is an ongoing process that includes an annual update of an operation’s organic system plan and inspection of fields and processing facilities. Inspectors verify that organic farming practices such as practicing long-term soil management, maintaining buffers between organic farms and neighboring conventional farms, and record-keeping are being followed. Processing inspections include review of the facility’s cleaning and pest control methods, ingredient transportation and storage, record-keeping, and audit control. Dimitri, C., and L. Oberholtzer. 2009. Marketing U.S. organic foods: Recent trends from farms to consumers. USDA-Economic Research Service. Economic Information Bulletin No.EIB-58. (Available online at: http://www.ers.usda.gov/publications/eib58/) (verified 22 March 2010). Economic Research Service—United States Department of Agriculture. 2009. Organic production [Online]. United States Department of Agriculture. Available at: http://www.ers.usda.gov/data/organic/ (verified 22 March 2010).